Welcome to David Rowlands' official website. 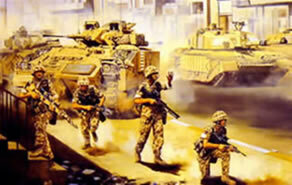 Many of David's paintings of the British Army in Iraq and Afghanistan have been published as prints and are available for you to buy. Search paintings by Regiment or Campaign: on the right or on the Gallery page . To commission a painting follow the Commission link.